"Easy weeknight dish that makes an attractive presentation. Can be easily reheated for potluck events. Serve over rigatoni, rice, or with garlic bread." Cook and stir sausage in a skillet over medium heat until cooked through, 5 to 7 minutes, partially draining the drippings. 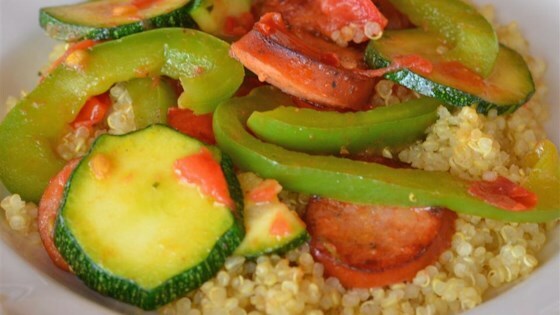 Add bell peppers and zucchini to the sausage; cook and stir until tender, about 5 minutes. Stir tomatoes, oil, chicken bouillon, salt, and pepper to sausage mixture; cook and stir until heated through, about 3 minutes. Wegman's® basting oil can substituted for the grapeseed oil (or any lightly flavored oil), or add your own garlic and seasonings to the grapeseed oil if desired. Mild Italian sausage can be substituted for the hot. My husband loved this easy to make sausage combination. I served the sausage combo over quinoa. Adding onions would make it perfect! There were no left overs. I would say it is a winner.